Season 5, Colorverse The Red Planet comes with 5 different color combinations. 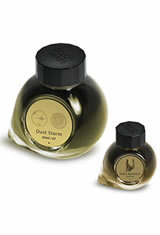 Each offers a large 65ml bottle of fountain pen ink with a smaller complimentary 15ml bottle of ink. Both bottles feature the iconic Colorverse glass bottle and come together in a well-packed cardboard box. The Red Planet, Season 5 ink continues with the Colorverse space theme and focuses on the planet Mars. "For Mars alone enables us to penetrate the secrets of astronomy which otherwise would remain forever hidden from us." Colorverse Season 5, The Red Planet launches February 15th, 2019. The Colorverse The Red Planet(65ml + 15ml) Fountain Pen Ink usually ships within 1 business day unless otherwise specified. Each Colorverse The Red Planet(65ml + 15ml) Fountain Pen Ink we sell is guaranteed to be genuine, authentic and will arrive brand new & unused! I love Colorverse inks. Yes, they're expensive, but they seem to come up with new twists on favorite colors that I really like and produce inks that are a joy to write with. I have at least six of their inks, and I still get a kick out of the packaging, especially the "mama and baby" concept of two bottles per package, along with the freebies of pen stand, bookmark, stickers and napkin. Since I already have more inks than I know what to do with, I bought the Martian/Life on Mars from this line more for the Life on Mars worms as I did anything else. When I got the inks, though, I fell in love with the colors themselves, same as always. The Life on Mars is especially eye-catching with it's muted teal-blue with a hint of gray to it. The Martian is a super-fun burnt-orange on the lighter side of the spectrum. It looks a LOT like a well-loved UT-Austin Longhorn T-shirt that an alum is still wearing a couple of years after graduation.